Tutorial of creating Node.js, Express.js and MongoDB CRUD Web Application from scratch using Express.js basic feature. This is the tutorial of how to create Node.js, Express.js and MongoDB CRUD Web Application from scratch with basic use of Express.js. For data modeling, we will use Mongoose.js module and for UI (User Interface) or front end, we use "ejs" instead of jade that comes with Express.js project generation. Don't waste your time, let's get started. As usual, in every of our tutorial always starting with project creation. Right now, we are creating new web application project using Express.js project generator that works in command line. We assume that you are already installed required tools or read the previous tutorial. Open the terminal or cmd then type this command. That command will create a project folder called "node-crud" with view template using "ejs" extension. Next, go to newly created project folder then install node modules. Next, we are installing Mongoose.js module by this command. Now, open and edit app.js from the root of the project folder. Add Mongoose.js to 'require' and call connection to MongoDB. We have to test connection to MongoDB server by running the application using "nodemon". If there's no "nodemon" installed, run this command first. After that, run the application. You should see this message in console or terminal if everything is ok.
To create Mongoose.js model, first, create a models folder. That command will create Employee.js which means we will create a model for Employee data. Now, open and edit that file and add Mongoose require. That Schema will mapping to MongoDB collections called product. If you want to know more about Mongoose Schema Datatypes you can find it here. Next, export that schema. Open and edit EmployeeController.js file. Add this require to the file. Create controller object for CRUD operations. Add show list of employees function. Add show single employee by id function. Add create employee function, it just redirects to create the page. Add save new employee function. Add edit employee by id function, it just redirects to edit page. Add update employee function for updating currently edited employee. Add delete employee by id function for remove single employee data. Finally, export employee controller as a module. Open and edit employee.js. First, add express require and create router. Add require that point to Employee controller. Next, add all routes to CRUD functions like below. Now, export router as a module. Next, open and edit app.js then add employee route as require after users require. Then add use after use of users. 5. Create Views for CRUD User Interface. Because we are creating separate views for employee CRUD, add a new folder in views folder and name it employee. Create new index.ejs inside views/employee folder. Open and edit index.ejs then add HTML codes like this. Create new HTML file for show employee page. Open and edit show.ejs then add this lines of HTML codes. Create new HTML file for creating new employee form page. Open and edit create.ejs then add this lines of HTML codes. Create new HTML file for edit current employee. Open and edit file edit.ejs then add this lines of HTML codes. The last thing to do is styling the views. Just open and edit public/stylesheets/style.css then replace all CSS code with this codes. Finally, you just can run and test the application CRUD functions. 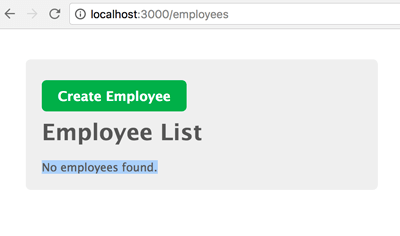 Open your browser and go to this URL "localhost:3000/employees". If you see the page with the message "No employees found." and a create button, it is mean your CRUD function is ready to test in the browser. Notes: This tutorial just the basic use of express.js and mongoose.js on the top of node.js. For further simple and quicker method, you can find a lot of npm modules and library that ready for using in your real projects. Here's the full source code from Github.